Output 90.8.1 shows the estimated spending among male and female students. You can also use PROC SURVEYREG to estimate these domain means. The benefit of this alternative approach is that PROC SURVEYREG provides more tools for additional analysis, such as domain means comparisons in a LSMEANS statement. The variable Gender is used as a model effect. The VADJUST=NONE option is used to produce variance estimates for domain means that are identical to those produced by PROC SURVEYMEANS. The LSMEANS statement requests that PROC SURVEYREG estimate the average spending in each gender group. The DIFF option requests that the procedure compute the difference among domain means. Output 90.8.2 displays the estimated weekly spending on ice cream among male and female students, respectively, and their standard errors. Female students spend $9.38 per week on average, and male students spend $8.92 per week on average. These domain means, including their standard errors, are identical to those in Output 90.8.1 which are produced by PROC SURVEYMEANS. Output 90.8.3 shows the estimated difference for weekly ice scream spending between the two gender groups. The female students spend $0.45 more than male students on average, and the difference is not statistically significant based on the t test. The Grade is specified in the CLASS statement to be used as an effect in the MODEL statement. The DIFF option in the LSMEANS statement requests that the procedure compute the difference among the domain means for the effect Grade. The ODS GRAPHICS statement enables ODS to create graphics. The PLOTS=(DIFF MEANPLOT(CL)) option requests two graphics: the domain means plot "MeanPlot" and their pairwise difference plot "DiffPlot". The CL suboption requests the "MeanPlot" to display confidence. For information about ODS Graphics, see Chapter 21, Statistical Graphics Using ODS. Output 90.8.4 shows the estimated weekly spending on ice cream for students within each grade. Students in Grade 7 spend the least, only $5.00 per week. Students in Grade 8 spend the most, $15.44 per week. Students in Grade 9 spend a little less at $10.09 per week. Output 90.8.5 plots the weekly spending results that are shown in Output 90.8.4. Output 90.8.6 displays pairwise comparisons for weekly ice scream spending among grades. 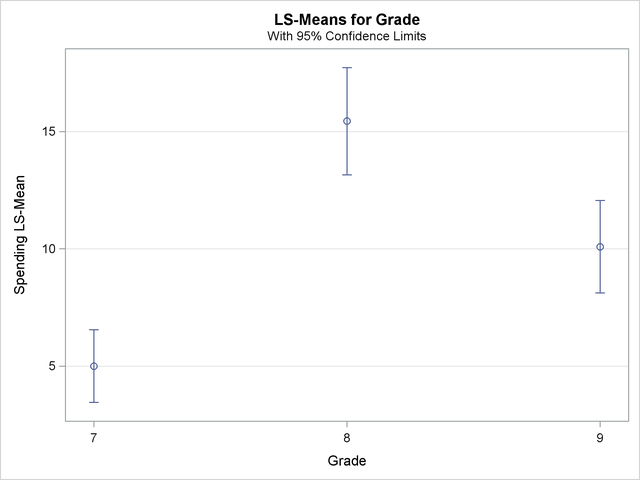 All the differences are significant based on t tests. Output 90.8.7 plots the comparisons that are shown in Output 90.8.6. 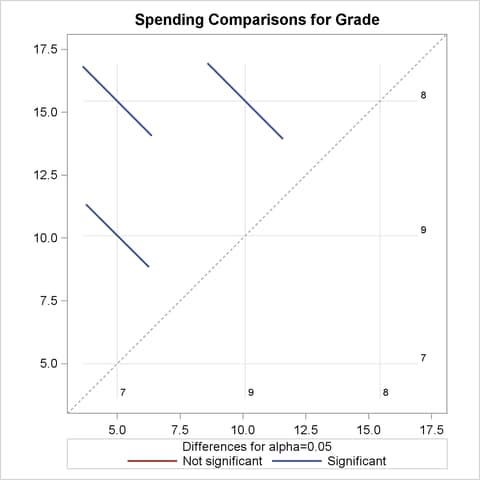 In Output 90.8.7, the spending for each grade is shown in the background grid on both axes. Comparisons for each pair of domain means are shown by colored bars at intersections of these grids. The length of each bar represents the width of the confidence intervals for the corresponding difference between domain means. The significance of these pairwise comparisons are indicated in the plot by whether these bars cross the 45-degree background dash-line across the plot. Since none of the three bars cross the dash-line, all pairwise comparisons are significant, as shown in Output 90.8.6.